When I started high school, it was difficult for me to read books, because I never read at home. I thought books were boring. Now, I don't think that books are boring anymore, because my English teacher, Ms. Stallworth, helps me pick books that I like. 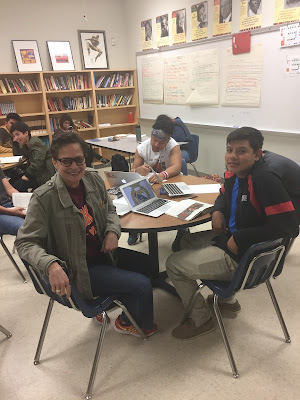 Ms. Stallworth has helped me improve a lot, because she encourages me to read by giving me time to read in classroom and offering reading suggestions. As a class, we set reading goals, and my goal is to read ten books by the end of the school year, and I am halfway to my goal. I have started to read at home, because I want to become a better reader and read challenging books. The only way I can read more challenging books is by reading a lot. So far, I have read Monsters by Walter Dean Myers, All American Boys by Jason Reynolds, Drown City by Don Brown, The Absolutely True Diary of a Part Time Indian by Sherman Alexie, and Garvey's Choice by Nikki Grimes. The book that I enjoyed the most is titled All American Boys by Brendan Kiely and Jason Reynolds. The book is about an African-American boy named Rashad who went to a store to buy chips, but he tripped over a lady and a bag of chips fell from his hand. The police officer named, Paul Galluzzo, thought Rashad was stealing, so the police officer beat Rashad brutally, and he ended up in the hospital. In the story, there is also a white boy named Quinn, and he saw what happened to Rashad. He knew that the officer that beat up Rashad was Paul Galluzzo, and he knew Paul personally; he was a father to him. By the end of the story, there is a huge protest to protest police brutality. What I like about this story is the fact that it is based on real life events that is happening in the United States today. The Absolutely True Diary of a Part Time Indian by Sherman Alexie was another book that I enjoyed reading this school year. The story is about a Native American boy named Arnold Spirit who lives on a Spokane Indian Reservation. He lives with his mom, dad, sister and grandmother. His best friend is Rowdy. Arnold switches from his school on the Reservation because of the poor conditions of the school, and he starts to attend a predominately white school that was a much better school academically. His parents agreed to allow Arnold to transfer to a new school. When he tells Rowdy that he is leaving their current school, Rowdy punches Arnold in the face, because leaving the “Rez” is seen as being a traitor. We get to see the changes that Arnold goes through in order to adjust to his new school. I liked this book because Arnold changes school, because he wants a good education and thinks about having a better future. After reading books that I have personally selected, I am not scared to read books anymore. I plan to continue to read at least forty-five minutes every night so I can become a better reader. I am happy with my reading life now!